Here at Apex Luxury Limousine Transportation we are proud to offer our comprehensive limo services to the residents and visitors of El Cerrito. Located just due North of Berkeley, El Cerrito is a family town not far from the beautiful San Francisco Bay. The main strip of stores and restaurants are located on one of the longest streets in the country, San Pablo Avenue that stretches all the way from downtown Oakland through the Delta regions. El Cerrito’s proximity to the intriguing culture of Berkeley give it a very Bay Area feel. The diversity in people, restaurants and cultural attractions make El Cerrito a must see for anyone who is interested in exploring what the real Bay Area is like. Besides a plethora of restaurants and retail shops San Pablo Avenue in El Cerrito is home to the historical Cerrito Theater. The Cerrito Theatre is a California landmark known for being a full service movie theatre. During films patrons are able to order beer, wine and anything from a full dinner menu. This makes the viewing experience at the Cerrito Theater both unique and a one of a kind. 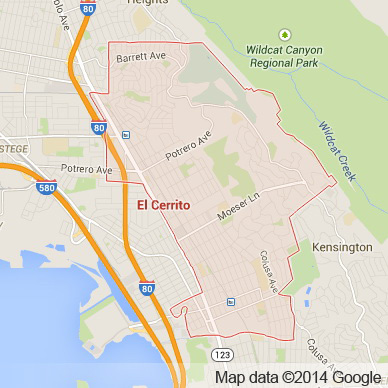 El Cerrito, like other East Bay towns, is a entry way to the beautiful natural landscape of the Bay Area. The Hillside Natural Open Space is a must visit for those who want to explore El Cerrito’s natural beauty. The intricate network of parks in El Cerrito help it stand apart from other Bay Area cities. The Parks are open and free to the public and are wonderful places to relax and have fun. Apex Limousine and Sedan Transportation is proud to offer residents and visitors alike our limo services. For those who are in the process of organizing their wedding day, Apex Limousines is here to help. Our Wedding Day limo services are comprehensive, elegant and luxurious. We work directly with wedding planners and families to ensure our limousine services compliment your special day. For parents and students alike Apex is a consistent favorite for junior proms and senior balls. Our professionalism ensures the right balance of safety and fun that has our guests coming back for more. For those who wish to explore places outside of El Cerrito, our limousine, sedan and luxury SUV services proudly offer full Napa Valley Wine Tours. Picking up our guests in El Cerrito wherever they choose, we promptly bring them in luxury to the finest wineries in Northern California. Some of these award winning wineries provide delicious wines you can only get in the Napa Valley. Our extensive knowledge of the region separate us from other companies. We will work directly with you to ensure that your experience in the wine country is as relaxing and memorable as you wish to make it. For those residing in or visiting El Cerrito we also offer comprehensive Bay Area airport sedan transportation services. We offer pick ups and drop offs at OAK, SFO and SJC. We are favorite among Bay Area travelers and businesses for our airport transportation services. Apex Limousines is El Cerrito’s favorite luxury transportation service. Our professionalism and commitment to quality transportation sets us apart from the rest. No matter what it is your looking for, what corner of El Cerrito or the greater Bay Area you wish to explore, here at Apex we will do everything to make your limo transportation experience the best it can be. Join us and together we can make your dreams come true one ride at a time. Please call us for car service all inclusive total for El Cerrito to/from Napa Valley transfer.